I have made it a point to try and keep gamepad support in the minds of developers leading up to our next several releases. I've started to put together a list of issues related primarily to supporting Gamepad mode. In this thread I'm going to post my rough drafts so far for the menus which need some Gamepad-related support. As I go along, feel free to post suggestions/corrections or rough drafts of issue reports for missing menus. I'm also attaching a zip file of all of the menus I was able to take screenshots of from YouTube videos of Xbox Morrowind playthroughs. Contains everything except the Alchemy, Spellmaking, Enchanting, Level-Up and the Stats menu. Last edited by Greendogo on 25 Nov 2017, 04:38, edited 2 times in total. In Gamepad GUI Mode, while the character menus are open (inventory, stats, map and magic), only one of the four menus should be viewable at a time and menu focus should be switchable between the next or previous menu with two mappable buttons. 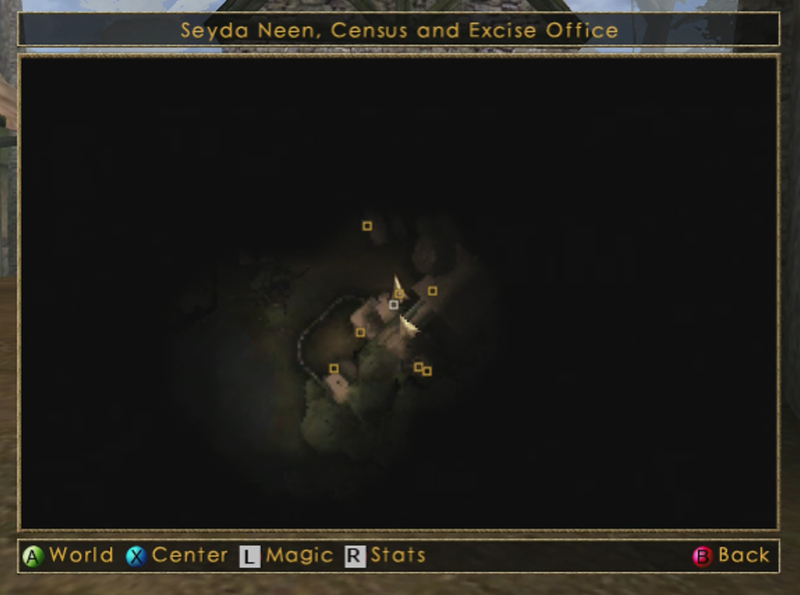 In the XBox version, this was mapped to the left and right triggers. Every menu has a quick information bar located above it and a control bar beneath it. The Quick Information Bar has quickly accessible information specific to that menu. The Control Bar informs the player of the available gamepad controls for that screen. All Character Menus have a "Previous", "Next" and "Back" option and need to have buttons mapped to those events. In Gamepad GUI Mode the Inventory Menu will use a joystick to navigate the inventory items one by one, indicated by highlighting the item's icon, additionally the item category buttons are selectable as well using the same joystick. -If the item is an armor its armor value and armor type are also listed, for example "Armor: 3 (Heavy)"
-If the item is enchanted, a charge bar is drawn depicting the remaining charge out of the total. This is drawn instead of the armor value or attack strength for armor and weapons respectively. Magic scrolls are exempt. 3) "Info" of the item, which is the overlay we currently use which lists all of the items visible attributes. Note: This quick info bar is reused in the Container menu and the Barter menu. Lists the players stats as usual. 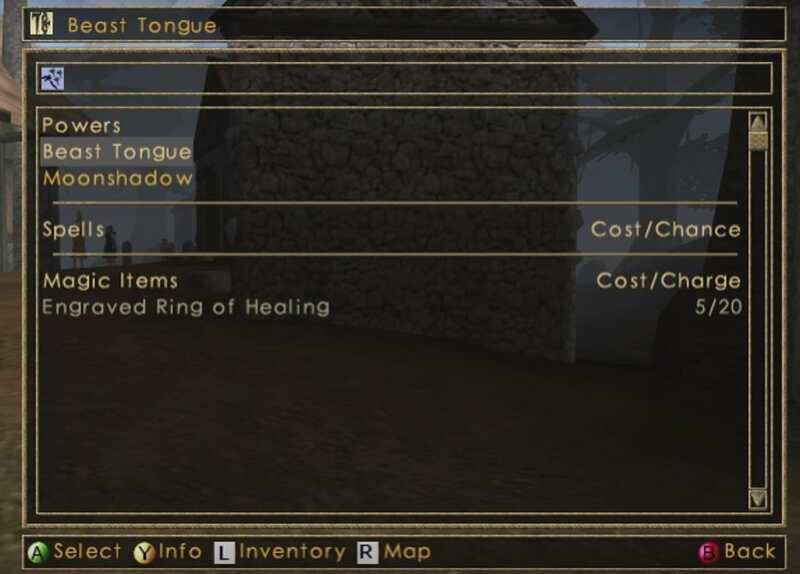 The Quick Information Bar lists the currently selected stat item's level. This is the only place in Gamepad GUI Mode that a mouse cursor is present and required (controlled with a thumbstick). Here the "mouse" will not leave the map menu and bringing it to the edge of the map will pan the map in that direction. The Quick Information Bar lists the name of the current or last hovered over location. 1) Toggling the map between "Local" and "World" - This eliminates the need for the "Local/World" button on the map itself. 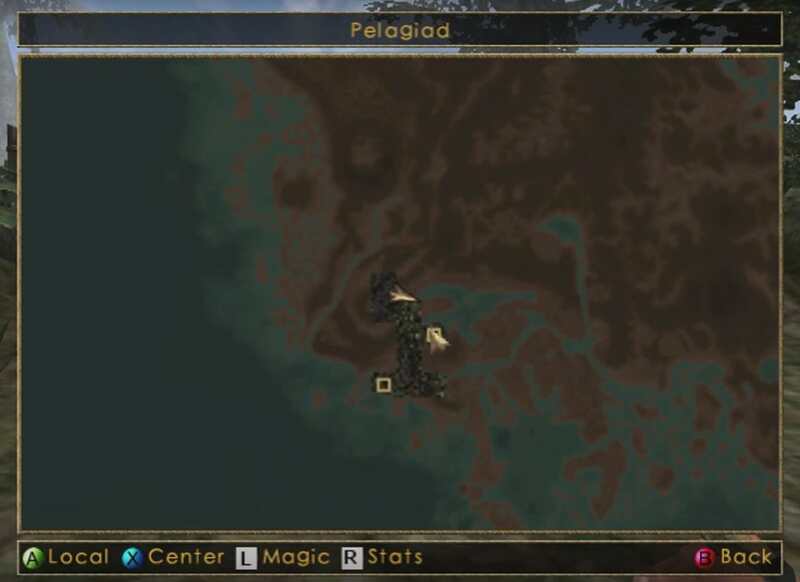 The "Add Note" feature for the local map wasn't in the original game, but it makes sense to keep it. In Gamepad GUI Mode the Magic Menu will use a joystick to navigate the magic inventory one by one, indicated by highlighting the item's name, additionally the currently active magic effects can be highlighted as well using the same joystick. 2) "Info" of the current magic, which is the overlay we currently use which lists all of the magic's visible attributes. IMO, it will look horribly on modern large screens. Can we use a SkyUI-style grid interface? 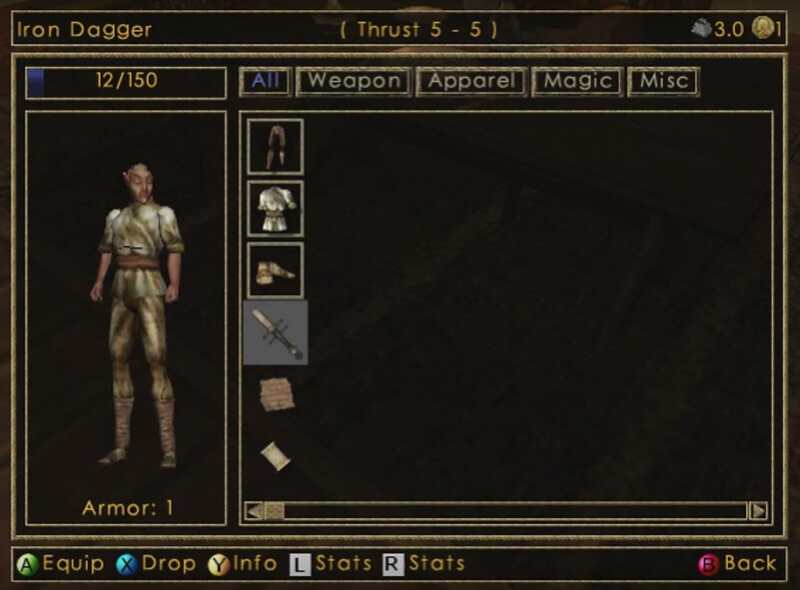 Anyway, Morrowind GUI was designed more than 15 years ago for a mouse input. Judging by screenshots, XBox one is just a hackish adaptation of PC GUI. Should we replicate it completely or can search for better solutions? TAB - switch between windows (e.g. map, stats, inventory). Should be actions for drop and search. We can even provide additional section in input settings for GUI navigation. If we make large scale changes to standard GUI elements these either need to be optional or modded in via content files. The later option would be a post-1.0 feature (probably far post-1.0 because we would need a large amount of groundwork first). I am only moderately excited about having the former in pre-1.0 OpenMW (though I wouldn't veto it, if it fits into the larger concept). As I wrote above I don't like the idea of doing this kind of work now because it distracts from OpenMW 1.0 and may take development time away. But if people really want to do it and we have the developer manpower, I won't stand in the way. However if we are going to do this, extensive design work and discussions would be in order, which belong into a separate thread. The baseline for the gamepad UI would still be the old inventory UI. @Greendogo I could take some photos of the missing Xbox GUI menus if it would help. Yes, let us save the much needed improvements until after we get the Vanilla GUI mostly mirrored. Then improve it to your hearts content. @augustt: The ones I'm missing are the Alchemy, Spellmaking, Enchanting, Level-Up and the Stats menu. I'm busy until mid December so I doubt I'll have a moment to look for xbox screenshots myself until then. Just to make sure you saw it, there's a zip file with ~41 screenshots on the first post. Ok, I'll try to get those to you. I have Morrowind GOTY and a 360 hooked up so I should be able to provide most any reference anyone needs going forward - however they will have to be in the format of phone pics off a TV as I don't have any kind of video capture card.